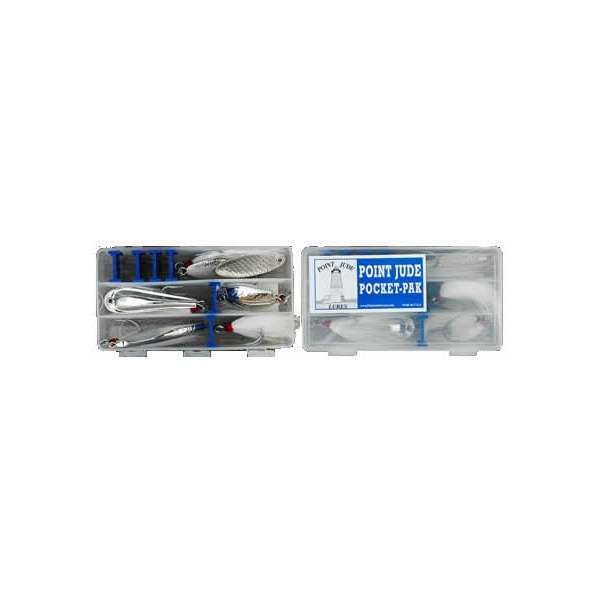 Includes 4 Point Jude Lures and 2 hand tied VMC 4 X siwash hooks, in a saltwater proof case. 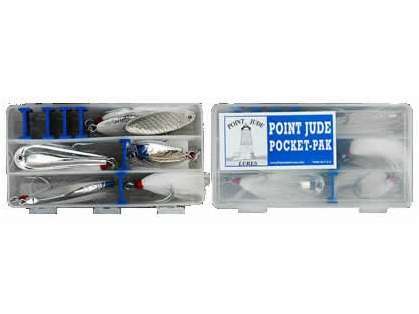 Point Jude Lures Pocket Pak : A collection of 4 deadly Point Jude Lures and 2 hand tied VMC 4 X strong siwash hooks, in a saltwater proof case. This features an infinite divider system, which allows you to arrange compartments to any size desired. love the whole Point Jude Lures Pocket Pak!! If you like using tins, this is an absolute must have! What size hooks come with this? What lures are included in the pocket pack? The Pocket Pack includes 1 each of; 1.5oz Pogi, 2oz Butterfish, 2oz. Mullet, 2 oz Sea Scallop. It also comes with 2 spare VMC bucktail hooks.